Following a scientific bachelor degree, Jonathan Pegon pursues his interest in biology by a university course leading him to a master's degree in neuroscience. 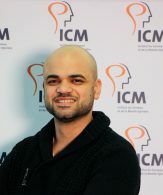 His internships and professional experience enable him to develop and consolidate his knowledge in neurobiology and his skills in biological technics. Jonathan join the Brain and Spine Institute in January 2015 as an engineer in the Biotechnologies and Biotherapies research team. Jonathan is working on the identification of the role of the Gpr88 receptor in Parkinson's disease in collaboration with Manuella Ingallinesi, Benjamin Galet, Nicole Faucon-Biguet, Anh Do Thi, under the direction of Rolando Meloni. Jonathan is actively involved in the development and optimization of experimental protocols. He also supports his colleagues in carrying out several biological experiments.